Mailing Lists – Advance Printing and Mailing INC.
Advance Printing and Mailing, Inc. is a leading provider of quality mailing lists, database hygiene services, and integrated direct marketing data. From the beginning we’ve maintained a passion for making a difference in the data industry. We want to make a difference in our clients’ campaign results. We will use our expertise to ensure that your data is accurate and targeted best to your specific needs. Designed, Sealed Delivered, We’re Yours! Finding the right mailing list is the best starting point in any mailing campaign. We can provide mailing lists that are compiled from industry-specific, or demographic-specific pools to yield several times higher response rates than lists compiled from general populations. That is the very purpose of direct mail, to be more specific to an audience than general advertising. We usually recommend that a survey of your current customers to find out why they selected you, or what makes you different from the rest, or why the stay loyal to you, etc. Knowing these specifics will generate the correct marketing “buttons” that need to be pushed with new prospects as you begin your marketing campaign. There are several different categories of lists available and which one you use will be determined by your specific audience. You can purchase single usage or multiple usage for up to one year on most choices. Let's Grow Your Business Now? 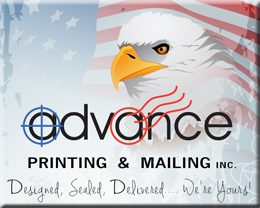 Advance Printing and Mailing are Direct Mail Professionals with printing and mailing under one roof. No need to look any further for your marketing solution.